I am getting ready to replace my two 20 gallon tall verts as they have some crippling problems. I am thinking about adding a vent below the door this time. There seem to be many praises about the sherman vent but I am wondering what are some specific benefits to the sherman vent vs just using the window screen framing and making the vent out of that similar to how the top vents on verts are often made? I just went the route of making all of my tanks into sliding door tanks.. I used just a window screen vent up top and affixed the tracks to the bottom of that. With that being said, it was slightly cheaper not by much to be honest.. I should of bit the bullet and did the sherman venting. It just looks cleaner. I have a little condensation on the glass with 2.5" vents. All in all, I am not disappointed with our route, it just looks cleaner and more viewing space with the sherman vents. My plan is to use magnets for the door so that I can easily remove it. I have magnetic doors right now and they are working pretty well. Since I will not have a sliding door I am not sure if the sherman ventilation give me any benefit. I've always used screen frame vents, and they have been very durable. I came up with a sliding-front vert design a few years ago that I really like. It is fairly easy to replicate this conversion with a flip down door as well. 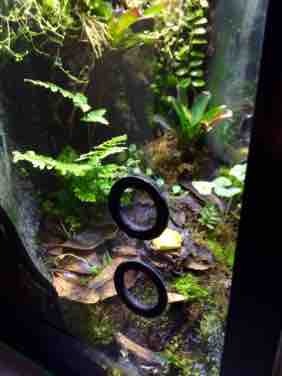 Another way of venting...if you don't mind drilling glass, is to drill holes in the top of your tank. Several along the front edge and then buy grommets and use no see um mesh. Fruit flies can't escape through the mesh, it looks clean because it is on the top of your tank, not obstructing your front viewing panel. I don't like anything on the front view. Most of us only have that one panel to view through, as we have multiple tanks side by side. I do everything I can to keep that one panel as void as possible of anything that will askew my view. Just find the plastic grommets online that are the size you want and then buy the glass drill bit. I have a big bag of grommets that should last me years and they were very cheap. Just another way to vent your tanks and ultra clean and stealthy. If you have questions just PM me and I can point you in the right direction. Azurel and Mohlerbear like this. The same reason why I do this is to keep it 100% viewable through the front tank. I don't dig the screen on top or bottom of look. I have a couple tanks like that and I'll never go back. Drill some holes and buy grommets like lunger explained. Total clear front view and there's really not ever any condensation. 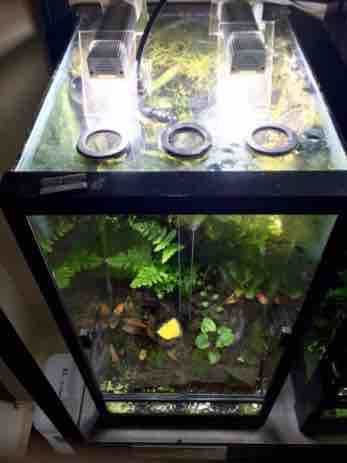 I have some small tanks that have fans running a few times to clear it up but honestly I'd be fine without the fans. I just had them laying around. Here's some pics. Hope it helps. Loading bowls and building vivs! Braaap! I have done the top vents on all of my tanks in the past. My current plan is to have a small vent like Dane suggested at the bottom of the tank and then drill my usual holes the top. My current setup has two top vents that are connected via pvc pipe with two fans one facing each direction in the pcv. This way I can switch the direction of the airflow from time to time. I also get less of a humidity drop since it is a closed loop. What I have found though is that while the top of the tank dries out nicely the bottom still stays very wet. I am hoping the bottom vent will help provide a more uniform humidity in the tank.